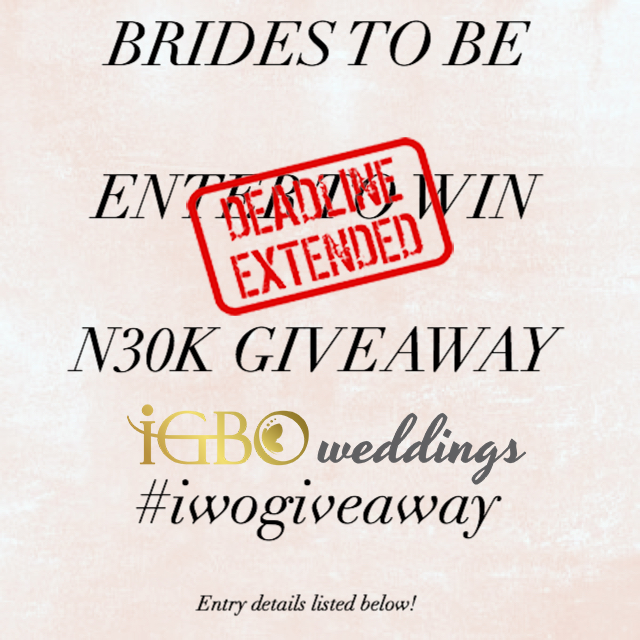 We’re so excited about the official launch of IgboWeddings.TV that we decided to EXTEND our Instagram only giveaway until Monday, 30th April 2018! 3. COMMENT below and tag your friends (to increase the chances of winning you can comment as many times as you wish by tagging all your friends!). 4. REPOST this image with the hashtag #iwogiveaway, get your friends to like it and follow us. Giveaway CLOSES on Monday, 30th April 2018 at 3 pm GMT (Nigeria Time). We will announce the randomly picked winners on Tuesday, 1st May 2018 at 3 pm GMT (Nigeria Time). The winners have to get in touch with us on Instagram via Direct Message within 3 days to claim their prize otherwise we will randomly pick other winners. So be sure to follow us on the gram so that you can join our giveaway! We’ll see you there! Previous Post Brides To Be! Enter our #iwogiveaway! Next Post Official Announcement: Igbo Weddings Launches TV Channel!